It’s nice to see a post like this (photo below) whilst browsing Facebook feeds. This gesture is so simple one may not really care at all. But looking deeply, it is actually commendable. 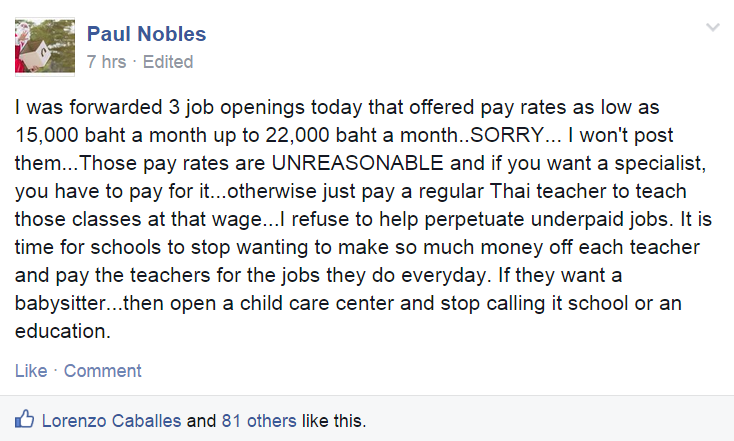 I wish admins of other groups related to teaching in Thailand will follow suit. I thought at first it was nothing. But I scrolled back and saw it wasn’t just a random whining. There’s a purpose. And I am for it. The admin of the Facebook page I’m a member of may not like the idea of having his words screen grabbed. But to Mr. Paul Nobles, I felt compelled to blog about you. I hope that’s okay with you. Let me know if not.